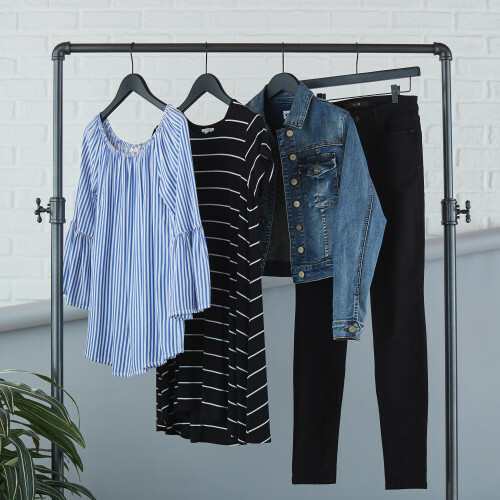 Get more mileage out of your wardrobe with a casual dress—it’s far more useful than a slinky going-out number you’ll wear once or twice before banishing it to the back of your closet. A stretch-knit shift dress is universally flattering. Choose classic stripes or a neutral color like olive to ensure it will be in your rotation for seasons to come. Every 20-something needs a handful of flattering, go-to tops they can throw on with their favorite skinnies for an impromptu evening out. Choose styles that strike a balance between flirty and polished. Contrast bare shoulders with a relaxed silhouette or flaunt an open back tempered by a higher neckline in front. The goal is to show off your best assets with a touch of class. While we readily admit to wearing athleisure on the regular (no shame in our fashion-forward comfort game), it’s important to have a more refined option at hand. A stretchy black skinny jean combines the comfort of a legging with the polish of a trouser. Opt for a rich, super-dark wash and avoid distressing for maximum versatility. Denim jackets are an incredibly versatile wardrobe staple you’ll reach for time and time again. Wear with a striped top and white skinnies, top off a floral dress, or embrace the “Canadian tuxedo” and pair with denim shorts and a basic tee. However you decide to style this timeless piece, be sure to choose a jacket with stretch so you can layer comfortably through every season. No matter how many times you’ve been around the sun, there are a few essentials that every woman needs in her style arsenal. After all, age is just a number. A detailed white tee elevates any look from basic to effortlessly stylish—try a knotted detail, ruffled sleeves, or an asymmetrical hemline.